Could you help with the class assignment? A friend in Houston has an assignment for his Food & Beverage Management class and could use your help as a potential diner. He has created a dinner menu for a hypothetical restaurant called UBÉ Restauran. It is a café featuring Filipino food that he would open in the Midtown area in Houston. He has asked for your help in reviewing the menu and identifying what you would order if you went to the restaurant. One selection from the Pulutan (appetizer) menu. One Sabaw (soup) or Ensalada (salad) or one of each if you want. One Ulam (entrée), Pancit (noodles), or one of each. Please designate which protein you would like and also if you would like bottomless rice to accompany the order. Order one Gulay (vegetable) if you would like. One Minatamis (dessert) if you would like. One Inuman (drink) if you would like. Also on your comment, could you please indicate the following? Are you Asian, Filipino, or Other? Thank you in advance for your help. Colin needs the responses by Tuesday the 25th so I will share whatever results have been received by then. 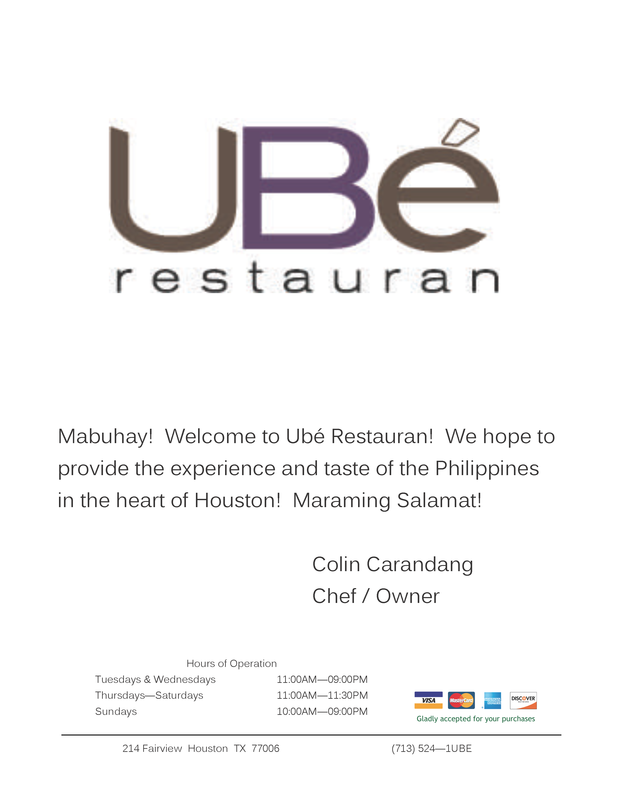 This entry was posted in Uncategorized and tagged Colin, Restauran, Restaurant, Ube by christao408. Bookmark the permalink. * Pulutan (appetizer) menu. I would prefer #5. But since I have to share with my husband, we’ll share #3 * Sabaw (soup) or Ensalada (salad) Me 21, my husband 13. * Ulam (entrée), Pancit (noodles), Me 36, husband 31. Me NO rice, husband bottomless rice. * Gulay (vegetable). We’ll both take a pass on the veggies. * Minatamis (dessert). #52, we’ll split it. * Inuman (drink). Husband will have 62. I want water.Sorry I have not been around much. It is the first week Of school, and I am not even the student. 1, 12, 34 (pork, garlic rice), 53, Asian, 20s. There are next to no vegetarian options. There’s fish and pork in the “vegetable” section (which I realize is not the “vegetarian” section, fair enough), and none of them sound very filling.20s, not Asian or Filipino.I’d get #21, #41 and #61. I opt for Weho gay diet and just ask for a glass of water with a slice of lemon.Wait, I mean, a quartered slice of lemon.Ok…if I were a “normal” person, which I am, I would order:4, 12, 21 with shrimp or tofu, 31 both with fried garlic rice(! ), 52, but no thanks on drinks.Well…I probably would skip 12 and 21, actually.So, 4, 31 with both meats and garlic rice is what I would actually eat. @Finity – i agree. being a vegetarian, i probably wouldn’t even eat there. ok, here goes –#1-13 – 22 – 33 – 53. Good luck. yum, what a menu! i haven’t had filipino food in a long time, so i’d definitely be up for it. since this is not real, i’m going to order one from each category (i’d probably never be able to eat all that in real life…)1, 13, 31 (chicken) + white rice, 35 (shrimp), 42, so torn between 51 or 52 but probably leaning towards 52, and 61 (with boba! ).asian, 20s. One Pulutan #3One Sabaw (soup) or Ensalada (salad) #11 and #21One Ulam (entrée), Pancit (noodles), #32 with white riceOrder one Gulay (vegetable) nahOne Minatamis (dessert) #52One Inuman (drink) nahnon-asian, 30snow I’m hungry! Pulutan: Lumpiang ShanghaiSabaw: Noche BuenaUlam: Pork Sinigang (my absolute fav!!) w/ 1 serving of riceMinatamis: Turon at Halayang UbeInuman: Ripe Mango ShakeI’m in my 20’s and Filipino.The entire menu sounds delicious, made my mouth water, haha. One selection from the Pulutan (appetizer) menu =2. 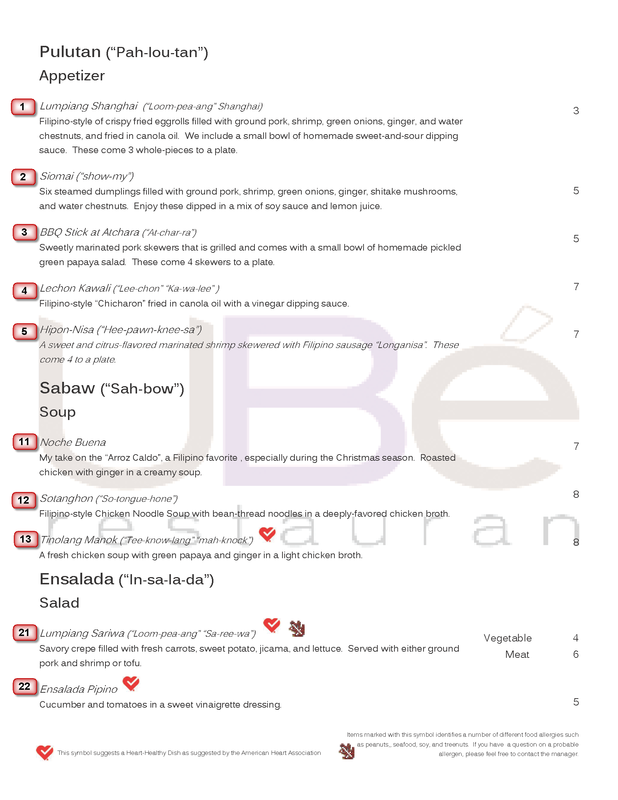 One Sabaw (soup) or Ensalada (salad) or one of each if you want=11. One Ulam (entrée)=31pork, Pancit (noodles)=35shrimp, or one of each. Please designate which protein you would like and also if you would like bottomless rice to accompany the order = yes for bottomless garlic fried rice. Order one Gulay (vegetable) if you would like=42. One Minatamis (dessert) if you would like=53. One Inuman (drink) if you would like=62 and yes to the tapioca!!!!. Sounds very different! I’m fantasizing that the drinks are like bubble tea…50s other. * One selection from the Pulutan (appetizer) menu. 1 * One Sabaw (soup) or Ensalada (salad) or one of each if you want. 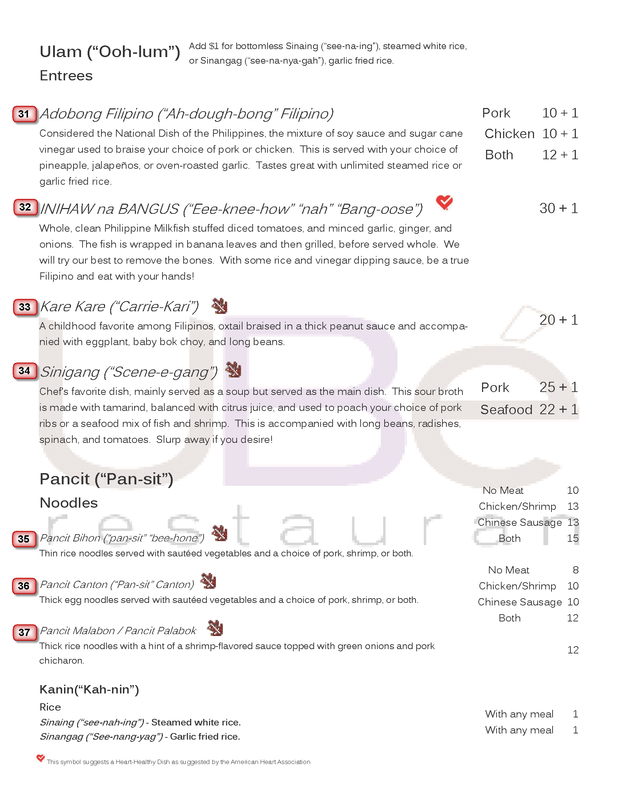 21 Pork * One Ulam (entrée), Pancit (noodles), or one of each. Please designate which protein you would like and also if you would like bottomless rice to accompany the order. 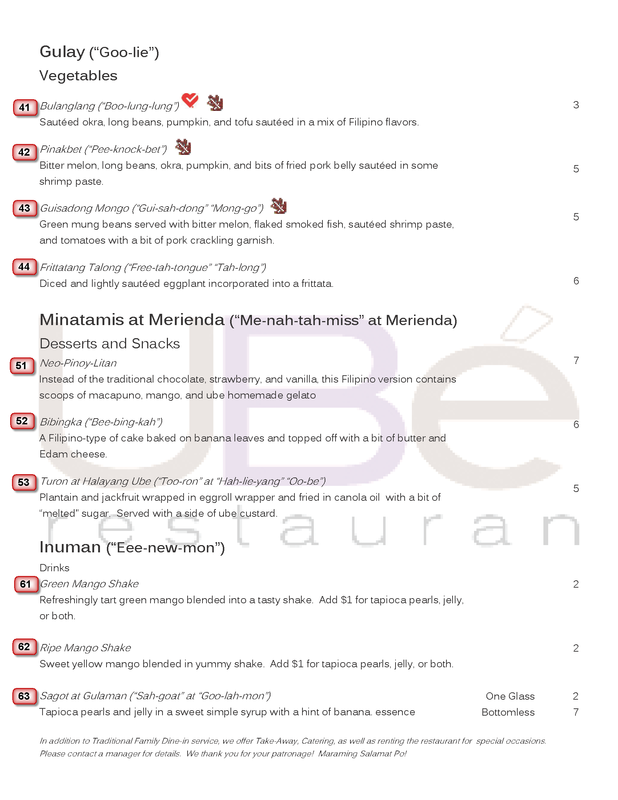 31 Chicken 36 Pork * Order one Gulay (vegetable) if you would like.None * One Minatamis (dessert) if you would like. 52 * One Inuman (drink) if you would like. 61Non-asian-20’s Sounds sooo good. @christao408 – No problemo!BTW, the very detailed and personal description is for the class only right? darn it! i’m too late. this is what i get for not being on xanga often enough. ok, i’m hungry now.